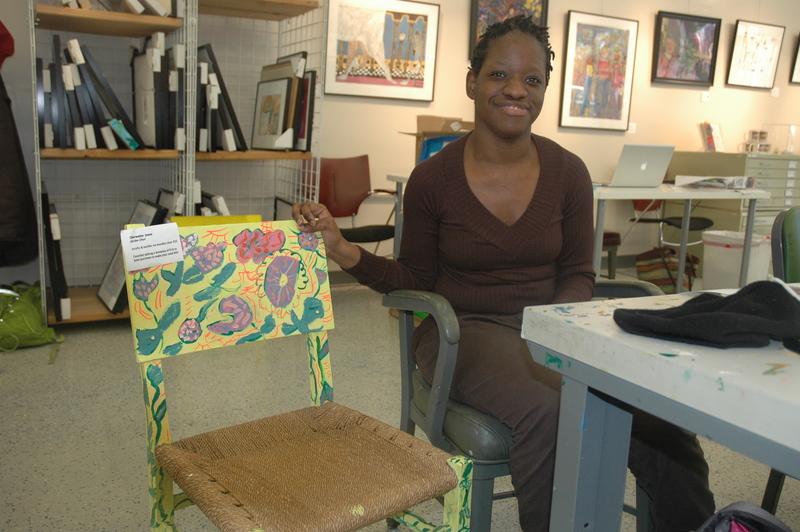 Charmaine Jones transformed a drab chair purchased at Community Forklift into a garden spot. This and pieces dressed up by artists at from Art Enables are part of the Forklift’s Green Gift Fair beginning Nov. 1. Where others saw a dull and dormant chair, Charmaine Jones imagined a four-legged garden. That verdant vision prompted the 28-year-old artist to cover every square inch of its exposed wood with a botanical bounty of roses, tulips, sunflowers and vines. The resurrected chair will be returning “home” as one of hundreds of handmade items that local crafters and artists will be selling from Nov. 1 through Dec. 29 at Community Forklift’s fifth annual Green Gift Fair. Art Enables, a studio and gallery for emerging artists with developmental disabilities, is one of 35 organizations and individuals selected to participate in the event at the Forklift’s Edmonston warehouse. In addition to green-themed paintings, the fair will feature an assortment of eco-friendly and affordable clothing, metalwork, woodcrafts, toys, baby gear, beauty care products, candles, greeting cards, housewares and stained glass mosaics. Prices start as low as $1. Staffers at Art Enables often comb the Forklift’s aisles for finds that encourage their cadre of 33 artists to experiment with new media. Chairs, cabinet doors, scrap wood, ceramic tiles and glass light shades are among the Forklift finds that allow the artists to transform the forlorn to the fanciful—and make some money selling their repurposed results. Mary Liniger, executive director at Art Enables, is used to fielding calls from Baldwin and other staffers seeking permission to “buy something really cool they just found at the Forklift.” She always gives them the green light, she says, because everything is so reasonably priced and nothing they carry back to the art studio at 2204 Rhode Island Ave. NE ever seems to go to waste. Aley Hasson, gallery and outreach assistant for Art Enables, is thrilled that the Forklift selected her organization to participate in this year’s Green Gift Fair. It’s the first year Art Enables submitted an application. 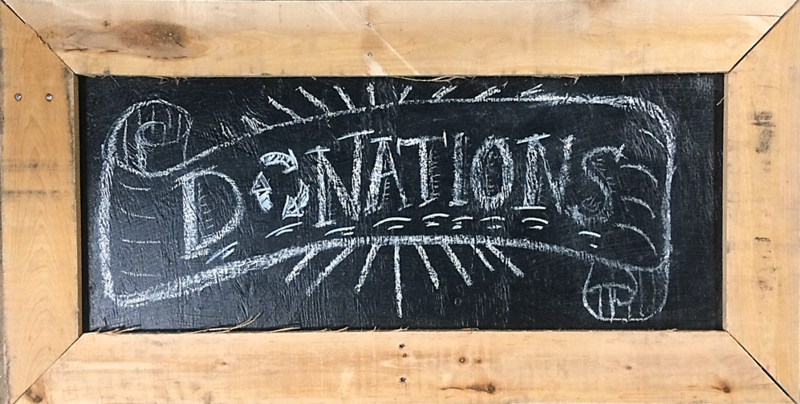 The Art Enables booth at the Green Gift Fair will showcase art from several artists who use reclaimed materials. For instance, it also will feature flower-themed paintings that Jones has completed on cabinet doors salvaged from the Forklift. 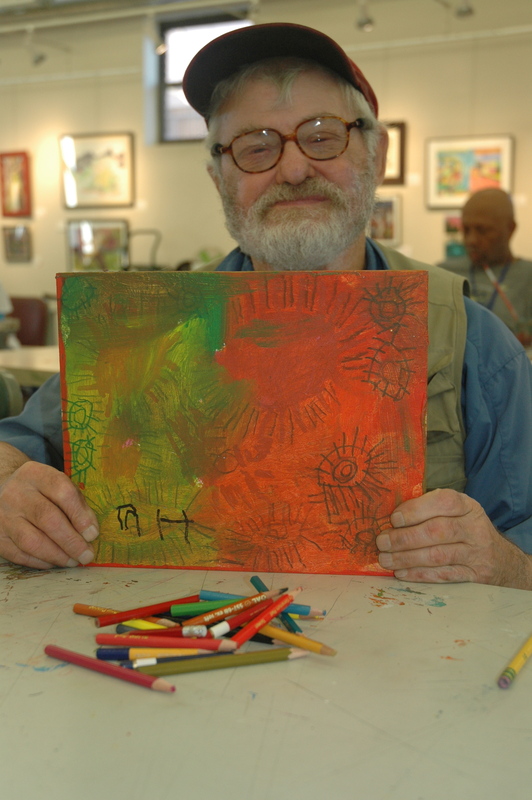 Jones, one of the youngest artists at Art Enables, will be joined by the nonprofit’s eldest artist, Maurice “Mo” Higgs. The cheerful and prolific 77-year-old wears down dozens of colored pencils daily while drawing renditions of his “hairy eyeball motif” on paper, wood scraps or about any other available surface. 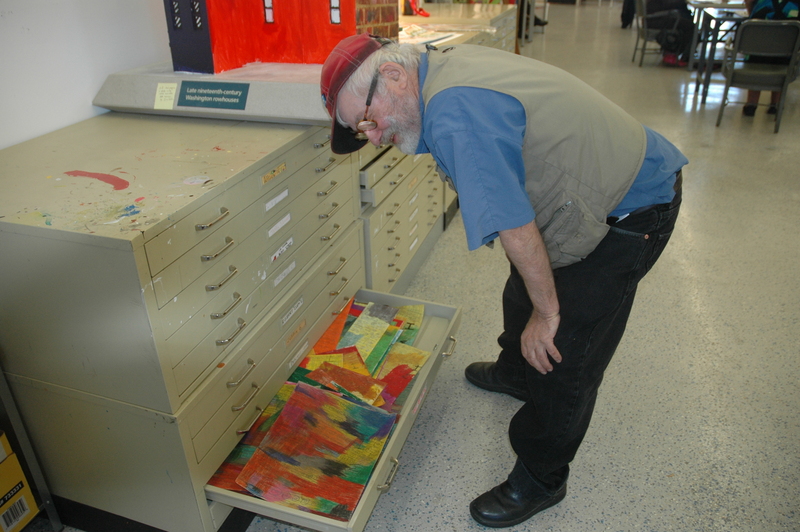 Maurice “Mo” Higgs draws so much at Art Enables that his storage drawer is often overflowing. This year’s call for original artwork incorporating the themes of recycling, sustainable living and environmental awareness attracted more responses than in the previous four years, so it will be the largest Green Gift Fair yet. Forklift staffers selected the top 35 applications from a field of 48. What are some of these artists doing? For starters, they’re turning beeswax into candles, transforming leftover metal parts into lamps, creating clothing from thrift-store finds, making painting-like landscapes and cityscapes from fabric scraps, handcrafting soaps and repurposing worn out belts and other leather goods into wearable art. 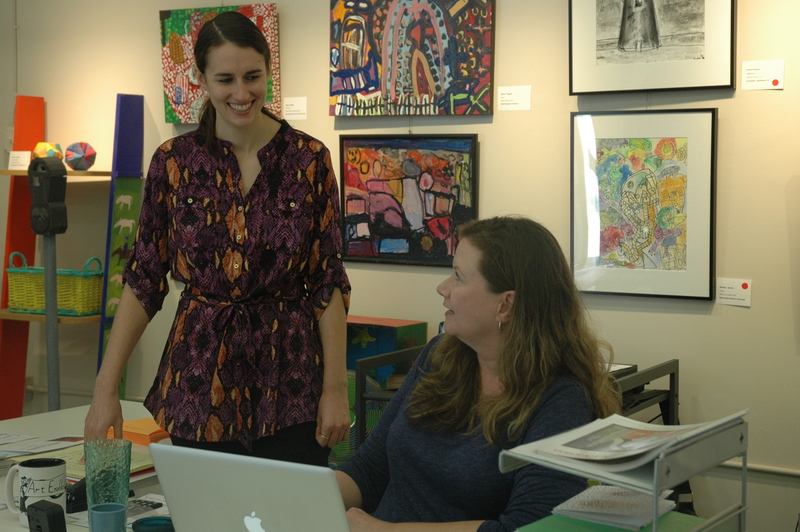 Aley Hasson, left, the gallery and outreach assistant at Art Enables, talks with her executive director, Mary Liniger, at the nonprofit’s studio and gallery in Northeast Washington, D.C. Artists from the organization will be participating in Community Forklift’s Green Gift Fair for the first time this year. Trickett emphasizes that the Green Gift Fair isn’t just an opportunity to ooh and ahh at the talents of participating artists. Forklift customers also will have the opportunity to participate in workshops on select weekend afternoons to try their hand at learning a new artistic skill. For example, Isabel Smith, Madeline Santiago and Elva Rosario of Marizab’s Treasures will teach participants how to craft jewelry from wire, washers, nails and other reclaimed materials; Jamie Langhoff of Seeing in Fabric will lead a workshop on turning old clothing into wall art suitable for framing; Jill Dickens from Evolve Skin LLC will share a simple recipe for a detoxifying salt scrub; and Don Nalezyty of Wright Woods will show how to use axes and knives to shape a spoon from a green log. Maurice “Mo” Higgs’s creates his signature “hairy eyeball motif” on salvaged cabinet doors and pretty much any other surface available. The elf-like Higgs, one of the Art Enables artists, is quick to note that any money he earns at the Green Gift Fair will go toward one of his regular trips to Florida. Liniger says she has no doubt Higgs’s vacation coffer will grow because he seems to develop an avid following wherever he shows his art. Though she’s talking about what unfolds at Art Enables on a daily basis, her words could just as easily apply to the appeal of all of the wares at the Green Gift Fair.